I love ratatouille. It's delicious and so good for your whole family. I usually make it in a large skillet on the stovetop ( I posted that recipe a few months ago), but after watching the movie Ratatouille this weekend, I decided to try to bake it. The prep time for this is probably 20 or so minutes because you have lots of veggies to peel and chop, but it was so nice to just put it in the oven and relax while it baked. You can puree this for little one's 9+ months, or cut it into bite size pieces for little one's eating finger food. 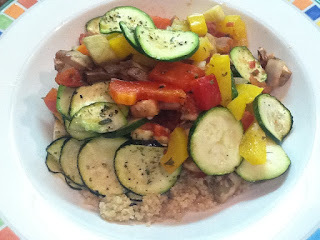 I served this with whole wheat cous cous. Preheat oven to 350F. Peel and dice 1 zucchini and set aside. 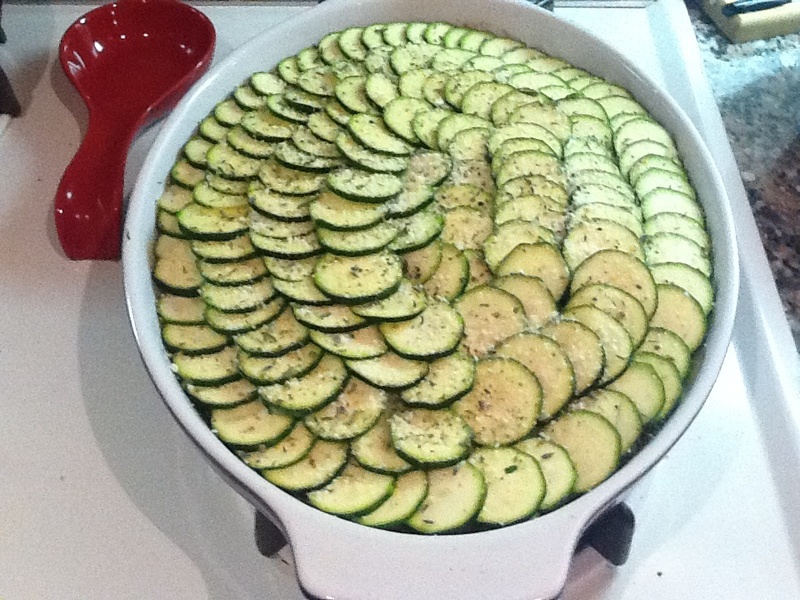 Slice the rest of the zucchinis into small thin rounds and set aside. Put chopped eggplant in a large mixing bowl with chopped mushrooms and 1 peeled and diced zucchini. Add 1 tblsp of Herbs de Provence, and a little salt and pepper to the bowl. Toss to coat vegetables. Pour diced tomatoes into a medium to large baking dish. Add finely diced onions to baking dish. Sprinkle onions and tomatoes with garlic powder and 1 tblsp Herbs de Provence. Pour seasoned veggies on top of tomatoes and onions. 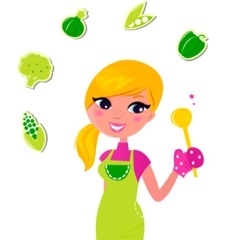 Add chopped peppers and spray vegetables generously with olive oil spray. Sprinkle with parmesan cheese, salt and pepper. 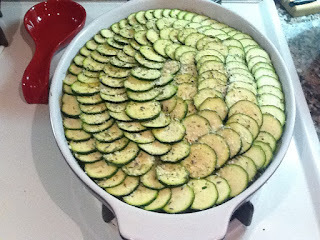 Top vegetables with zucchini rounds, spray with cooking spray and sprinkle with Herbs de provence and parmesan cheese. Place in oven and bake for 45 minutes. Remember to test temperature on your bottom lip before you feed it to your little one. Serve and enjoy! Serving size for your little one is between 1/2 to 3/4 cup.